Creativity, like any other skill, requires practice. There is a large part of being a great creative that comes from talent, the rest comes from experience. Over time the ideas come faster, you know whether it's good or not quicker, and you know when and how to take risks. To be a great creative, you have to practice every day. Even when you don't want to. Especially when you don't want to. You have to train your brain to jump through hoops with a flaming baton in its mouth. Every single time you snap your fingers. You have to practice starting, then stopping, then starting again. And then starting in a completely different direction. While riding a unicycle. 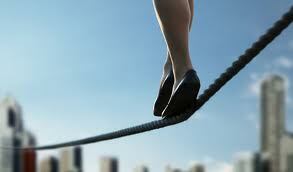 You have to walk the tightrope holding a 10 foot pole with super artistic on one end and super strategic on the other. Juggle multiple projects, each with multiple moving parts. Be a contortionist and fit your ideas into the tight brand and legal boxes your client has. Then you will need to be able to pile into a car with 8 other clowns and come out smiling and ready to dazzle the crowd. Oh. I think I just figured out why The Creative Circus is called The Creative Circus. Art directors, copywriter and designer are pretty much freak show acts working their hardest to entertain the public.